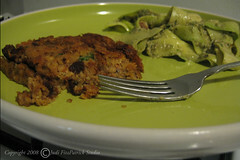 Delicious salmon cakes and raw pesto with zucchini (recipe by Ginger) - yummy. Best of all, daughter J cooked and I didn't have to. After this meal, we attended the Sustainable Arlington Committee meeting and learned more about what the town in doing in all areas of sustainability. More on that another time. I'll also post here the links to these recipes when I have a chance to look that up - check back here in a couple of days if you are interested. Thank you, Ginger and Karen for these delicious dishes, and thanks, Jenn, for serving them. Mmmm...I have some salmon...maybe I'll make something similar tonight! Always nice when someone else does the cooking! Happy you enjoyed the meal :) I am eating the leftover pesto on carrots for lunch right now and it is still totally yummy even if I have serious garlic breath lol. thanks judi! it looks good in that picture...makes me want some right now, but i just ate some hummus. i saw jenn's comment, haha! it is pretty garlicky, huh?